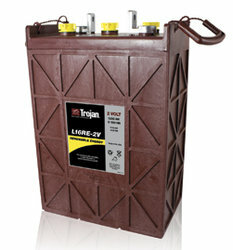 Trojan L16RE-2V 1110 AH Deep Cycle Battery Free Delivery to many locations in the Northeast. Trojan Storage Battery is designed for renewable energy systems, particularly off-grid. Length 11.575" Width 7.125" Height 17.7"
This is a 2 volt battery, you will need to buy in mulitples of six for 12, 24, or 48 volt battery systems.